The first thing that comes in mind when you hear the word ‘signature’ is a pen and paper and your initials. This has been true for the past century or so when people used to write their initials in ink to authorize a document and its content. If we look at the more historic era, name seals ring a bell where people used molten candle wax and a seal to sign and authorize a document. In the modern era the same notion can’t be followed because everything has gone digital. Our digital age has 3 major types of signatures that include wet, digital and electronic signatures. Let’s have a look at all these signature types individually and how they affect business processes. As the name suggests, wet signature is created through the use of a pen or feather and ink on a piece of paper. This type of signature has been in use for centuries and is quite often used these days as well. A perfect example is your bank cheque which requires a signature to be valid. In daily business activities wet signatures are still quite common but they impede the overall efficiency of the daily business tasks. The prime reason is the physical exchange of a paper based document and then storing that paper document for future records. The digital era demands faster, more effective processes to ensure proper and accurate decisions can be made. Agree or Disagree: This might seem odd, but clicking ‘Agree’ or ‘Disagree’ on those long contracts, terms of service & privacy statements is actually your electronic signature that makes the content of that document valid and your signatures make it legally binding on you. Using A Stylus: Tablets and Smartphones that support touch screens have stylus as an instrument for navigation as well as creating an electronic signature. You simply create your signature on the tablet (like you do with a pen on a paper) and it captures and converts it into an electronic format. We live in a digital era and we need a digital signature that can help us validate any document and its content. A digital signature is also known as a cryptographic signature and as the name suggests, encryption and decryption is involved in this process. The digital signature is the most ‘secure’ form of validation whereby a certificate of authority is generated by an authorized party (Windows) which signifies that the document has not been altered in any way during its transmission and validates that both parties involved have a true identity. People usually use electronic and digital signature terms interchangeably but they are different in the aspect of security. Digital signature offer the highest level of security as compared to the electronic signature however they have the same legal standing and you become legally bound once you create these signatures. Business Process – How Signatures Help? Everything is digital these days in all types of business activities however all these signature types are used extensively, some more than others. Using electronic and digital signatures may seem an efficient way of signing and authorizing documents but sometimes they hamper the process. This usually occurs due to human error when someone forgets to sign a document at the specified time. A recent solution has been through document management systems where a reminder can be sent to the user at a specified interval to ensure they sign and authorize the document. 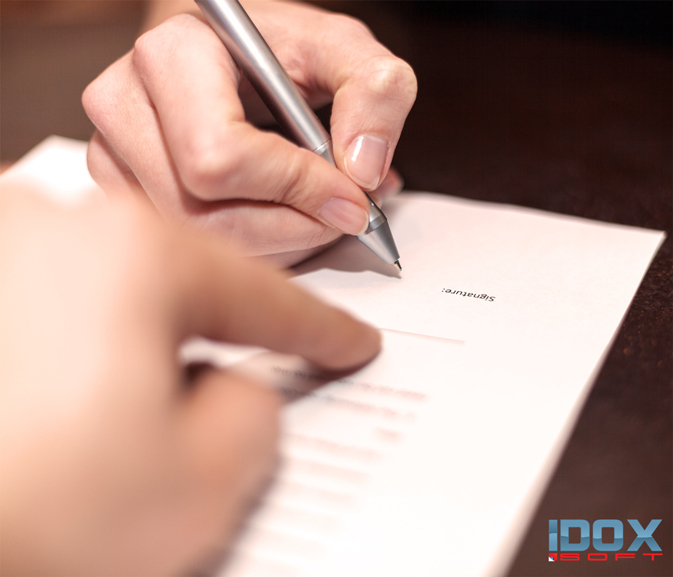 To learn more about digital signatures on iDOX Document Management System, simply visit our blog and request online demo to get a firsthand look at how the system helps you manage your documents and authorize them online. Today’s fast paced technology world has created an evolutionary cycle for different things and signatures are one of them. Before the digital era there were wet signatures that were made using a pen but in a digital era where everything is in the form of 0s and 1s new types of signatures exist that include the digital and electronic signatures. These signatures offer the same authority as a paper based signature and are commonly used in banking, emails and even document management software.